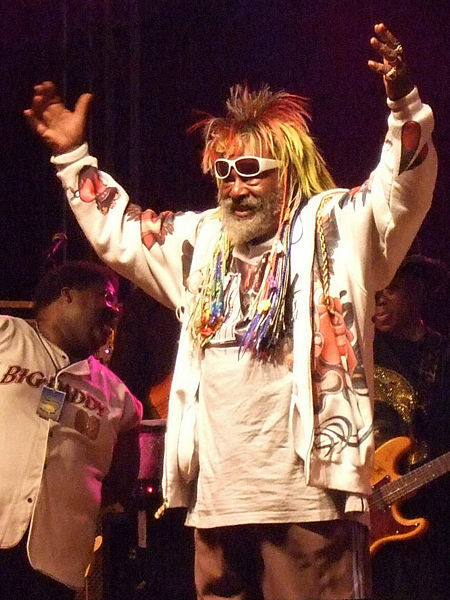 George Clinton’s show hasn’t changed much over the past several years, but that hasn’t stopped him from continuing to attract new fans. Saturday night’s show at Crossroads KC marks the third time Clinton’s Parliament-Funkadelic have performed in Kansas City in the last four years, and each time the legion of hands branded with an “X” – signifying under 21 – is prevalent. The forecast of a chilly evening – temperatures dipped into the 40s – and rain didn’t keep the lot behind Grinders from filling up over two-thirds with a crowd that cut through every demographic in the city. The band opened with “Funkentelechy” followed by “Bop Gun.” Clinton wouldn’t emerge in his rainbow dreadlocked-glory for another half hour, but his crew of funksters were more than capable of keeping the music and spectacle rolling in his absence. Parliament-Funkadelic shows may be closer to a three-ring circus than a traditional concert. Onstage at any moment are longtime band leader Garry “Diaper Man” Shider and backing singers dressed like roller girls and buffalo soldiers. Toss in characters like the Poo Poo Man, a pimp in zoot suit who lead the band through a James Brown tribute they’ve been doing since before Brown died, and Sir Nose, a dancer and agitator, and you’ve got a cross between Cecil B. DeMille’s cast of thousands and Ken Kesey’s Merry Pranksters.